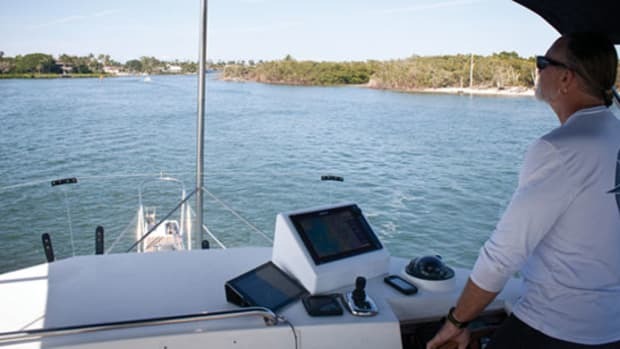 Vesper Marine marks a no-anchoring area, using AIS to place virtual buoys and improve communication via an automated system. The author, left, and Jeff Robbins, CEO and cofounder of Vesper Marine, discuss virtual buoys and addressed safety messages. The Vesper WatchMate Vision has a touchscreen and built-in Wi-Fi (right). Join me, if you will, for a glimpse of boating in the future. It’s a world where your boat tells you just where to go, and what to do while you’re there. In a manner of speaking, your helm will be equipped with a heads-up display, like the visor on the helmet of an attack-helicopter pilot. 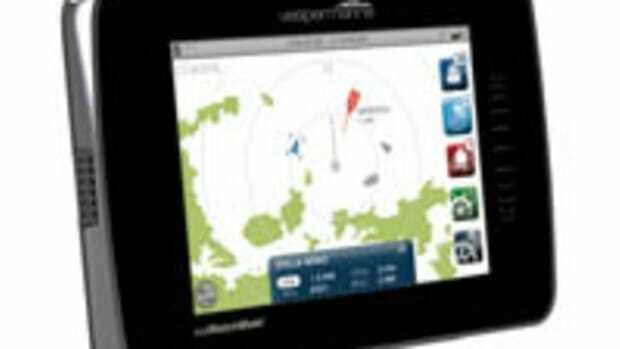 All that tiny type that we now see on paper charts next to aids to navigation, or shared via cursor-hover on electronic charts, will be transmitted by the helm onto that display, floating next to the navaid in question. Hopefully the helmet won’t be too heavy by then. How are your neck muscles? I’m joking of course, but I did just return from a sea trial on Long Island Sound, where Vesper Marine (www.vespermarine.com), the New Zealand-based company focused on AIS solutions, is working with the New York Power Authority to mark a no-anchor zone with some advanced “virtual buoys” that appear on an AIS-enabled chart plotter—and only there. The power company has four subsea cables crossing beneath Long Island Sound from the north side of the sound in New Rochelle, New York, to the south side, on Long Island, in East Garden City. The four 345,000-volt, self-contained, fluid-filled cables carry 600 megawatts each, and are jetted into the mud at the bottom of the sound, so they’re relatively protected. But anchor strikes from ships and barges can cause problems. The last time a cable was struck was in January 2014, when it was hit by a barge anchor. “Dielectric fluid runs inside the conductor, so if you breach the outer sheathing, you could potentially have dielectric fluid that leaks into Long Island Sound,” says Bob Schwab, director of asset maintenance management for the New York Power Authority. “In that case it probably ended up releasing 6,600 gallons of dielectric fluid. Even though we took the cable out of service, we have to keep the fluid pressure and flow to keep the salt water from going inside the cable.” On top of that environmental impact, there’s the power outage, which can have significant economic and public-safety repercussions. And also the cost of the whole mess, which ran to $34 million from the capping of the cable to repairing it in January and February, during what ended up being a very cold winter. 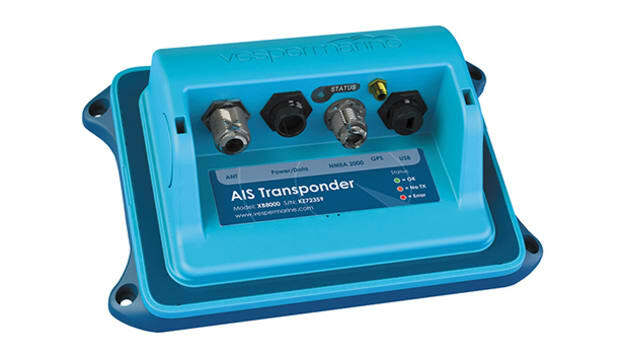 Vesper began to develop a solution, using both software and hardware, that would put the two-way power of the AIS system to work, both through virtual buoys that exist on the system all the time, and through another system that reads vessel movement and responds to it accordingly. 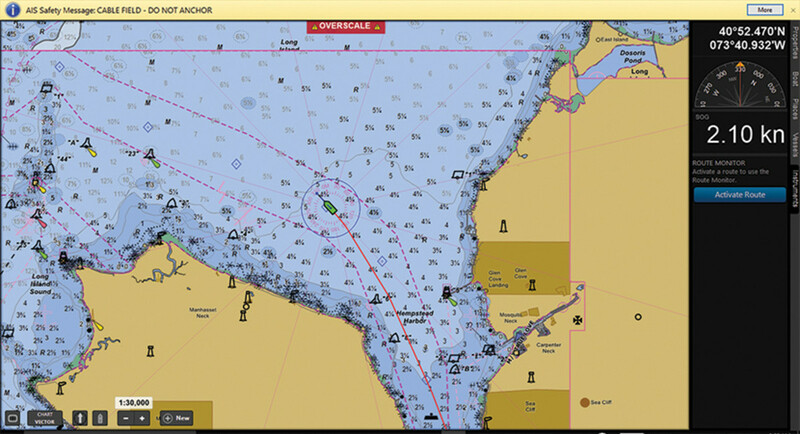 This navigation chart is part of the desktop software that the New York Power Authority uses to monitor its new Vesper Marine AIS safety warning system, which protects subsea power cables from anchor strikes. 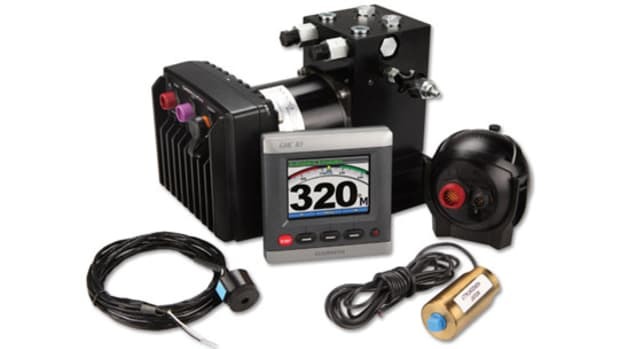 The NYPA system transmits an addressed safety related message, a somewhat underutilized function of the AIS system. This means that the message is addressed specifically to that particular vessel and will only show up on that vessel and not any others. 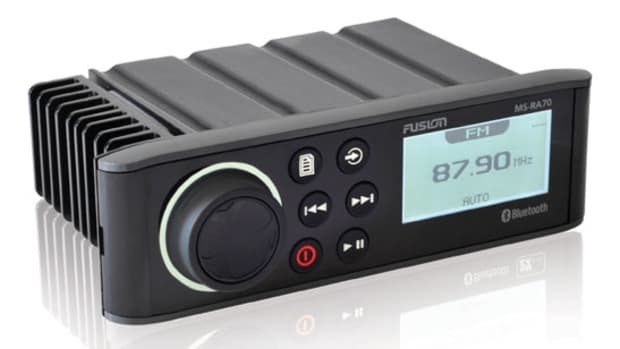 And this is understood and handled by all Class A and Class B transponders, as it’s a required part of their specifications. Now here’s where the AIS system’s strengths really come into play. 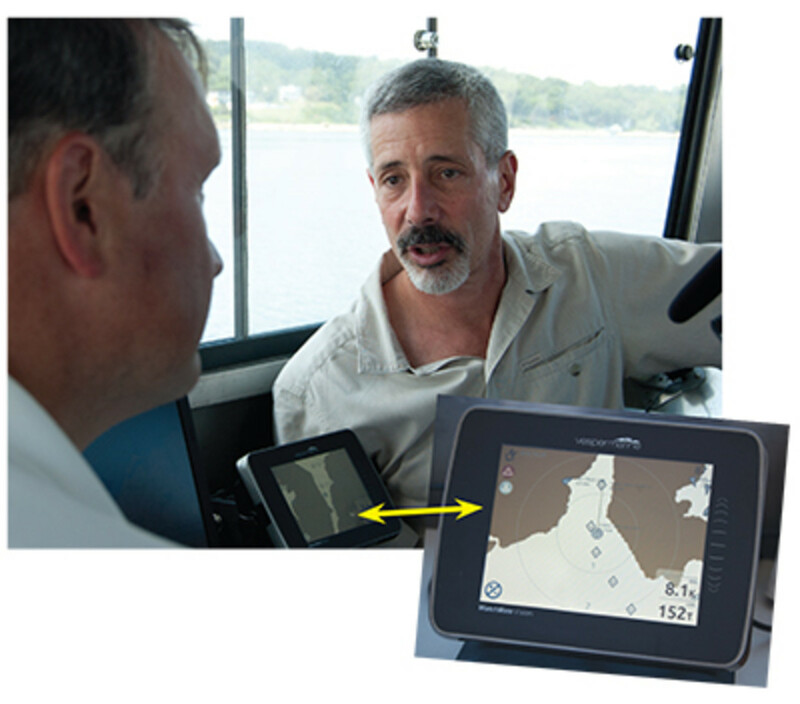 Because AIS by definition shares extensive data on the vessel in question (keeping in mind that most boats using AIS are commercial vessels required to carry it by regulation), the NYPA and Vesper Marine can tailor the alert system to the needs at hand. 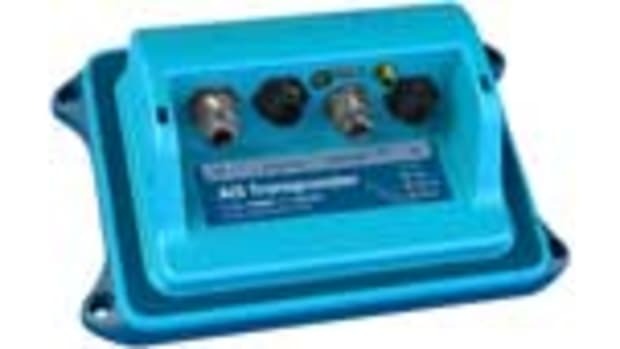 And because the NYPA transceiver is well situated, the range that Schwab gets from the system is very helpful. 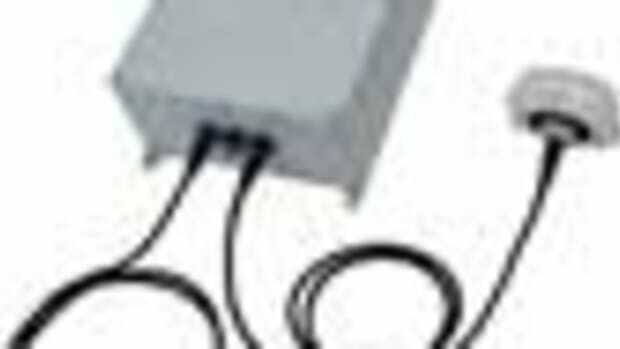 “We’ve developed a number of protection zones around the cable system, and we have two installations of the hardware to transmit and receive the information: One is located on the Long Island side and the other is in our home office in a White Plains office building, which is on the 18th floor and gives us very good range,” he says. “Because we’re so high up, I can actually monitor vessel traffic in the Hudson River, Long Island Sound, and the Atlantic very close to Manhattan.” At this writing the protection zones were due to go to fully automated mode in a matter of days. “It’s a Web-based system, so even if I’m on vacation I can go on my cell phone to see what’s going on,” Schwab says. 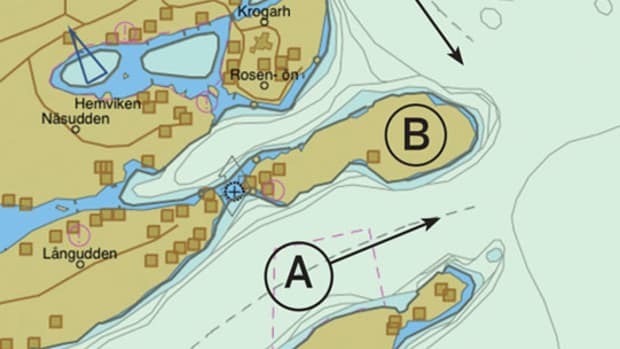 “If I get a message or even make some changes to the protection zones for vessels—there are a lot of attributes that can be changed.” Schwab outlined one instance where a construction project at a nearby marina meant barges would be moving through the protection zone and making movements that would draw the warning messages on their required AIS systems. “We have a lot of traffic here at one of the marinas where they’re working,” he says. “I don’t want to keep sending the messages that they’re getting close to the cable every day, so I can put them on an exception list.” Schwab also outlined a case where a work zone to repair the cable could add recreational boats to a protection zone delineated by the system, only for the time when the workboats are in position. The recreational boats using AIS would have the benefit of greater understanding of what’s going on without getting too close. The Coast Guard is mostly concerned with safety at sea, of course, rather than the power system remaining online. But a system that’s clearly equipped to do both, and much more, is definitely worth slowing down for, to have a closer look. And maybe boaters considering AIS should do the same. This article originally appeared in the September 2016 issue of Power & Motoryacht magazine. 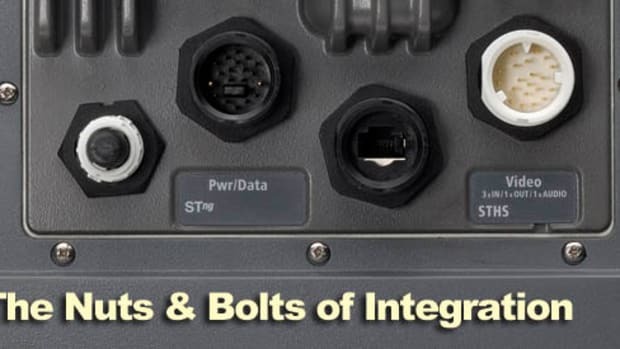 A Breakdown of Protocol: how boats’ systems converse.